The “Contact Us” section of this website notes that we were hoping to learn more about Jacka stoves and ovens than we knew at the time (2016) of publishing The Complete History. Now (2018) we do have some further information and images of ovens, although this is still a limited sample and we would love to hear about further examples of Jacka stoves, ovens or ranges. As noted in The Complete History, William Jacka Snr was listed in the 1840s as both blacksmith and stovemaker in St. Day, Cornwall (pp.74-5). According to a modern restorer of Cornish ranges, JW Engineering in Camborne, cast iron ranges were made in Redruth from the 1830s. Larger foundries cast complete ranges and sold them. These foundries also sold cast stove parts to town and village blacksmiths to complete with their own designs and sell under their own names.1 It is possible this was the arrangement for stoves sold by William Jacka Snr. The most common range – in working class cottages – involved a 30 inch hotplate although much larger ranges were also made. Ranges manufactured west of Truro in places like St Day featured decorative castings on the front panels of ovens and the Jackas apparently maintained this tradition in South Australia (see below). Soon after arriving in Adelaide in 1849, William Jacka Snr was open for business as a stove and oven maker (Complete History, p.226). The business was joined by sons Joseph, Samuel and Walter in the 1860s and 70s with Samuel as the main force in “S. Jacka, Stove, Oven and Range Manufacturer” after William Snr’s death in 1867. 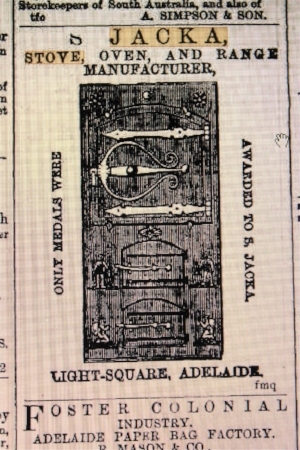 Advertisements in Adelaide papers from 1871 illustrated Jacka ovens.2 Ads in the Express and Telegraph (recently added to Trove) had a clear image (photo above right). We are grateful to Steve Reed, a descendant of Annie Maud Jacka (1869-1900), youngest daughter of William Jnr and Jane Jacka, who alerted us to the presence of a Jacka oven in a historic Willunga house. In an amazing coincidence, the house, St. Mary’s Lodge, was the former home of Thomas Martin (1825-1900), owner of the Willunga slate quarry (Complete History, pp. 152-7). The Jacka oven, built into the brick wall of the original kitchen beside a hearth and chimney (photo at right), is similar but not identical to that in the S Jacka advertisement above, suggesting that the Willunga oven may have been installed in the 1870s – a time when the Jackas and Martins would have had no connection. The central knob above the oven door connects to a damper in the brick flue behind the oven: increasing the draught was one way of controlling the heat of the fire. An adjustable vent in the oven door would also have contributed to temperature control. Photographs at right show embossed decorations on either side of the fire box and ash box doors. Their presence is consistent with the style of west Cornwall stoves. The images may be Jacka-specific designs although nothing is known about their origin or significance.